“We [were] sick of people feeling they know who we are and what we’re capable of” – guitarist/vocalist of Sleater-Kinney, Carrie Brownstein. The seventh album from Sleater-Kinney, The Woods is a creative and raucously executed ‘screw you.’ Ferocious and critically acclaimed (one of Rolling Stone’s 100 best albums of the 2000s, a 9/10 for a plethora of publications including Pitchfork), The Woods was also met with disdain from devoted fans for its departure from the band’s usually catchy and erratic punk rock. After being signed with respected label Kill Rock Stars for over a decade, the band ventured from its Seattle home base (an environment that fostered such seminal names as Nirvana and Bikini Kill). This album looked towards more classic rock inspiration than punk – the band citing Led Zeppelin, Deep Purple, and Jimi Hendrix as their influences. With such a different direction from the rest of their discography, a fresh approach to production was called for. With 12 hours of recording a day occurring under 10 feet of snow, Sleater-Kinney and producer David Fridmann created an angry mess – in the best sense of the word. For their seventh album, Sleater-Kinney left their home town and shacked up with a star producer on the other side of the country. This is the sound of The Woods. David Fridmann is known for his work with The Flaming Lips, Mercury Rev, Weezer, MGMT and Tame Impala. 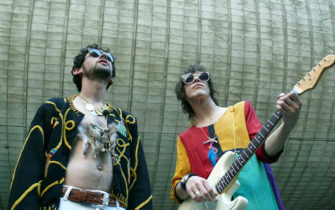 Brownstein noted that Fridmann respected the band and was interested in the sound, but was taken aback by their raw, uncontained live performance. He was reportedly reticent to say anything positive about the band, thinking all their past albums sounded the same. Approaching Sleater-Kinney was a complex task for the producer, who had enjoyed some commercial success, yet was most famous for the psychedelic tones he conjured for The Flaming Lips on Yoshimi Battles the Pink Robots. As a result of hearing the raw live performance, David Fridmann decided to try and emulate this rather than creating a polished sound where every note was clear in the mi; a challenging, but in the end, hugely successful undertaking for the producer. The band consciously attempted to recreate their enigmatic live performance – there were only overdubs on a few vocal and guitar tracks. The rest of the record was played like the trio was on stage, resulting in a expansive, primal sound. Played in the same room and feeding off of each other’s energy, the judicious use of spill adds to the pseudo-psychedelic chorus, the freewheeling vitality of the sound and the unexpected, and the space of the record. Distant miking and the blend of different reverberant surfaces also augments the cavernous atmosphere of the album. Sounds bounce off walls, each other, and themselves within the tiny studio environment without any separation or sound proofing. Microphones were placed close to amps and mixed with omnidirectional recordings of the entire room experience. Guitars ring out in an attempt to touch each other through the viscous ether that is each song. If it weren’t for the punchy accents of the drumming or we’d have a bit of trouble deciphering the songs through the waves of sound. Janet Weiss on the kit serves as the antithesis to the spaciousness of heavily affected guitars and spacious miking. Fridmann at one point told her to play like Keith Moon but with a blanket over top – a low pass filter further drives this idea home on songs like Wilderness. With Corin Tucker and Carrie Brownstein both playing electric guitars with no delineation of who was rhythm and who was lead, the standard conventions for mixing their sound were a little irrelevant. Fridmann creating sludge in the low end was a way to compensate for the lack of bass in their live sound. As a bass player himself for the band Mercury Rev, Fridmann was remiss to leave the lower frequencies out, bumping up bass in the mix so the kick drum and dirge of distortion would flavour the album unlike those that came before in Sleater-Kinney’s discography. While these days neo-punk bands like Camp Cope, Carb on Carb, and Hannahband survive without heavy low-end mixes, Fridmann’s enhancement of the lower end of the spectrum acts as a counterweight to the nebulous melodies of the record, grounding the careening voices of Sleater-Kinney in the overall mix. On hearing the saccharine and most low-key song on the album, Modern Girl, you could be fooled into thinking that your speakers were busted – in fact Eddie Vedder of Pearl Jam attests to The Woods blowing out his car’s sound system. The distortion and contrast of said crunch, is immense. The band didn’t go halfway with the saturation on this album. They turned it up, they switched the song structure on its head, they blew out studio equipment, they duelled for 3 minutes in the guitar solo of Let’s Call It Love, and threw subtlety out the window. The departure from their older records is evident in approach as well as sound. Being isolated under 10 feet of snow in New York away from their families, the three band members and the producer fought over everything. Tensions were high, and there are recollections of all sorts of arguments and fiery moments from the band members who had dated years before, to having to do a retake because of a minute mistake. The band recounts doing multiple takes because they thought the vocals didn’t sound right. Janet Weiss and Carrie Brownstein would say things to ignite the temper of Corin Tucker – she would get mad and then do amazing things. The violent vibrato on The Fox where Tucker’s voice is given reverb to liken her shouts to a disrespected whammy bar is a prime example. If you think the vocals sound like they’re spitting vitriol, it is certainly real life. The music is charged with the ferocity of real life conflict, and you can hear it. The last two songs on the record were originally recorded one after another, being part of the same track and over 15 minutes long. After the guitarists realised they were in the same key, they kept the energy throughout both, yielding an interesting result. They were afraid of becoming rehearsed and too comfortable with each other, moving away from their roots in punk. Adding this improvisation and disintegration by not even having a planned structure or tempo ensured roughness, wholeheartedly embracing the type of music they loved to hear and create. Taking a step out of their comfort zone – and the zone of their most dedicated fans – may have been a risky step for the Sleater-Kinney, but they came out of production with something truly unique to their discography and any existing albums of the time. The Woods is angry, unapologetic, and quirky – and its no wonder it is so heralded as such a momentous record.